A first look at my friend and co-New Antiquarian Ryan Matthew's beautiful new Victorian-inspired men's suit/accessory/denim shop, Against Nature. He picked up these incredible albino peacocks (there's actually a pair) from the same guy who sold me my two fighting swans. A selection of Ryan's baubles. 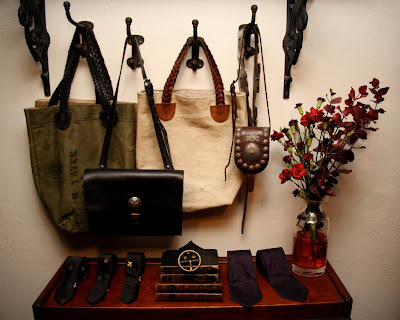 Various Ryan Matthew bags and totes, the latter of which are made from old mail bags and vintage braided leather belts. More Ryan Matthew bags and a peek into the dressing room. Ready-to-wear suits from the Doyle Mueser line from co-owners Amber Doyle and Jake Mueser. They also offer bespoke services. A Beauchene baboon skull, disarticulated and mounted by Ryan. I'm so excited to finally get a peek into this amazing world Ryan has created, I can't wait to visit!! And Alice's (forestbound.com) mail bags look so perfect tucked into the rest of his treasures!! Wow, wow, wow!! May I move in, please?! Thanks for posting - this looks amazing. Now I want to dress in mens clothes! So incredibly thrilled to have happened upon your blog!!! If NYC was still my stomping ground, I would definitely be checking out Against Nature! Looks incredible. Oh, looks like a great spot! Do you know Stock Vintage on 13th Street between Lafayette and 3rd? If not, and you like this - you must check it out! Amazing! I have got to get to NY. the store looks like a dream. and against nature (a rebours) is a favourite book of mine... i cant wait to stop by/move in! Love love it all, you just don't know how many times I keep coming back to these pics. Ooh, I'm reading 'Against Nature' right now. And looking for a new bag....Fate. holy hell, this store looks incredible! every man needs to take a cue from these wares. Oooh, thanks for sharing! Looks like an amazing store and I will definitely check it out when I'm in the city next month! Nice collection .. I like it! Great blog! I appreciate the hard work every body is putting in to maintain the website and all the visitors to it, the webmasters are doing great job, thanks again to all the good people.